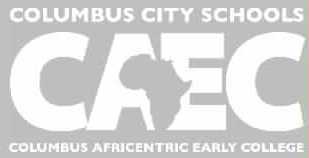 School Days Uniforms is your primary uniform store and stocks all Columbus Africentric Early College uniform apparel. All our your uniform sweaters and sweatshirts listed below will have the CAEC embroidered logo on the left chest. The price listed includes all required embroidery. We highly suggest first time students come to the Gahanna location to try-on all items before purchasing. Uniform sizes may vary from retail store clothing. At check out you can select to pick-up your items at our Gahanna location, have your items shipped to your home for a UPS charge or delivered FREE to the school office each week during the academic school year . Khaki shorts, pants, skirts or skorts. Purple short or long sleeve polo shirts. Purple V-Neck Pullover sweater with CAEC crest or purple sweatshirt with crest. Khaki shorts, pants, skirts or skorts. Black short or long sleeve polo shirts. Black V-Neck Pullover, V-Neck Cardigan or Vest sweater with CAEC crest or black sweatshirt with crest.